With fans bombarded with 100 new bands a day, bands find it even harder to prove themselves day after day.You’d think things would be easier when you have a built in fanbase. For Craig Owens and Bradley Bell of Chiodos, along with Bryan Beeler (guitar), Marcus VanKirk (bass) and Dave Shapiro (drums) this comes as a welcomed challenge. Owens fronts while Bell takes to the keys in this upbeat, happy go lucky band. It’s that light-hearted/good time approach that sets Cinematic Sunrise apart in a landscape of bands that are more into playing up the gloomy side of life. 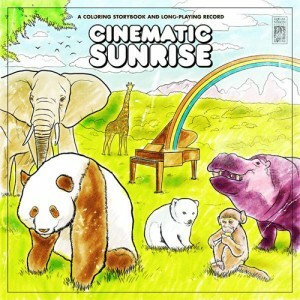 There’s such a grand energy and fearlessness that should come with starting a new project and Cinematic Sunrise have that along with a great synergy that is felt through the final product; their EP A Coloring Storybook and Long Playing Record. It seems we all hold our breathe when it comes to side projects and sometimes we’re even guilty of wanting things to fail. This should not be the case for Cinematic Sunrise, with every lyric and arrangement set so perfectly, ranging from delicate and pretty to pulsing and feverish.